WEST HARTFORD, CT-The Hartford Hawks continued their America East schedule as the Retrievers from University of Maryland Baltimore County (UMBC) arrived at the Reich Pavilion Volleyball gym for a Sunday afternoon match. Hartford would win a hard fought set 1, but it UMBC would pick up wins in close sets 2 and 3 before putting the home team away in set 4. It all began with Hartford pulling out to an 8 to 3 lead. The Hawks scored on a UMBC attack error, and other point would follow, soon after that UMBC served into the net, Michelle Cordell came up with a block, a Hawks’ put over the net followed, a Retriever attack out of bounds, Cordell and Maddison Molyneux’s tandem block, and a UMBC spike into the net. UMBC’s three points came from a Sabrina Hoeks’ tap to the gap in the defense, and her service ace after that, as well as a kill by a Retriever a few rallies later. UMBC called a time out to regroup and picked up two quick points off, to make the score 8-5. Cordell smashed the ball from the net and landed it just in bounds, to extend the lead, a long rally back and forth followed with a good dig by Lindsay Ford and a good defensive save by Pam Jarrett among the plays, before Imam Kennedy unleashed a big kill. On the next volley back and forth Ford had another good defensive save, but Ashley Oscars won the joust with a Hartford player at the net for the ball and knocked it over. Lindsay Makowicki responded with a kill that flew off a defensive dig attempt, but Oscars spiked off the blockers. A long back and forth followed, including good defensive saves by Makowicki and Alyssa Lang, before a UMBC kill succeeded. Erin Macro came up with one of her many kills, but Hoeks received a set and hammered it home in response. When a Hawk attack hit the antenna the score was tied 11-11. U of H drew out to a brief lead again, but UMBC caught up to bring the score to 16-16. The Hawks had points off a UMBC serve out of bounds, Kami Nethersole whacking the ball of a defender’s dig and outside the lines, a UMBC serve into the net, Erin Macro’s ace when her serve kabonked off a defender and hit the score’s table, and a spike out of bounds by the Retrievers. They in turn scored off a huge kill from Hoeks , Lang winning a battle at the net, and following that with another spike kill, Kennedy launched a rocket from the net, and Hartford also attacked out of bounds. The battle royale really started up at this point as neither team could pull ahead. Erin Macro took the lead for her team with a kill, but Kennedy’s shot tied it back up. Cordell received a set and sent a missile off a defender and into the seats, but Kira Giles used chicanery and her fake set turned into a backhanded attack over the net which fell in. Jarrett them rocketed a serve off a Hawk and into the score’s table, for an Ace, but Cordell blasted the ball cross court. UMBC benefited from a UHa attack out of bounds following that, but Erin Macro hammered her kill off a set to tie it back up. Hartford gained another point to take the lead 21-20, and Erin Macro stuffed an attack with a block, but a serve out of bounds, and a Lang tap over the net to a gap in the defensive setup tied the score at 22. Erin Macro again launched a kill, but a serve into the net tied it up. Following a good save by Molyneux, Erin Macro had huge cross court spike to regain the lead. But a Retriever picked up a tap over after Jarrett’s defensive good play. Nethersole’s kill was hit by blockers and out of bounds, but Lang positively crushed an attack to tie it up. A spike out of bounds by UMBC put Hartford back up and another UMBC attack error gave Hartford a 27-25 score and the set win. UMBC 0, Hartford 1. UMBC would pull out to a lead early reaching a 2-6 lead before Hartford called a time out. 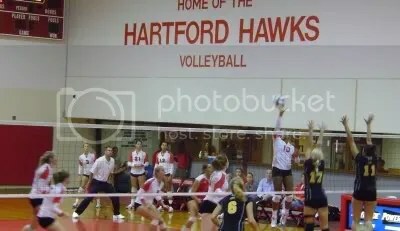 Hoeks’s spike popped off the blockers, another spike followed, despite great saves by either side by Molyneux and Jarrett, Naomi Bush came up with a block, Lang set the ball to the defense’s left corner, Hartford spiked into the net, and Allie Spaay got a running start and tipped the ball to a gap. Hartford’s points came from two UMBC attack errors. After the TO, Nethersole and Cordell each picked up kills, but UMBC scored again, only to serve into the net and put Hartford back within 2, 5-7. The Retrievers would go on a run though picking up a kill despite a good save by Sarah Boss, Oscars thundered a spike down on the Hawks, following a diving play by Spaay, a Retriever set the ball off the D to the opposing bench to make it 5-10. A serve out of bounds ended the run, but Hartford served out of bounds as well. UMBC picked up two more attack errors, once with a four contact error and the other with a spike out of bounds that slammed into the empty seat next to Hartford Coach Ferguson. Bush spiked off the blockers to keep the lead at 4, but a serve into the net returned it to 3, only to have Bush wham a kill over, but a serve into the net, and a spike out of bounds got Hartford back within 2, 11-13. A Hartford attack just out of bounds , a Giles service ace, and a Spaay block gave the Retrievers another 5 point lead. Nethersole’s response was a big spike off a set., but Um14’s tip off the defense to the floor keep the lead at 5, 12-17. A serve into the net by the Retrievers put Hartford back within 4, but Kennedy launched a kill, and U of H attacked out of bounds leading to another Hartford time out. Erin Macro emerged from the play stoppage with a smash from the net, but Oscars had a cross court smash of her own. Erin Macro responded again with a blast, and Hallie Fullagar added a service ace as well. A two hit error on Hartford though awarded a point to the visitors and Lang tapped the ball over for another. With the score at 16-22, Erin Macro received a set and launched a hugely massive titanic spike, seemingly the hardest blast of the game, for a point. Nethersole added a kill, but a U of H hit into the net put thing sat 18-23. Hartford picked up another kill that landed just in bounds, but a point went UMBC’s way next, and Giles served up an ace off a dig and the score was 19-25 with UMBC winning set 2. UMBC 1, Hartford 1. UMBC did not have as much control in set 3 as they did in set 2 as each team fought to a 12-12 tie. For the Retrievers points came from a point to start the match, a Kennedy kill, a Oscars hit to the gap, a Lang kill, a Hartford spike out of bounds, a Oscars rocket, another UHA spike out of bounds, a spike into the net by the hawks, a kill soon after, a Hawk spike out of bounds, a Bush whap off the defenders and out of bounds, and a UHa cross court spike out of play. Hartford scored in response to UMBC’s first point, later a Retriever serve into the net added a point, Molyneux killed from the net, Cordell blasted a shot from the net as well, Makowicki launched a spike which hit a defender and flew at the Retriever bench, A UMBC spike into the net, Ford put the ball down when it flew by the net, Fullagar had another serve ace off a dig and out of bounds, UMBC served out of bounds and later spiked into the net, Nethersole spiked off the blockers and out of bounds, and picked up another point soon afterward. UMBC called a time out. The Retrievers opened play up again with a Lang hard kill, and a Oscars kill as well. Molyneux picked up a spike in response, but Oscars again struck with a big time smash. The Hawks were able to pick up another point when a UMBC return flew out of bounds, and UMBC spiked into the net to tie the set at 15. Another UH point would follow but a serve into the net tied it back up. Erin Macro then hit pay dirt again, but despite a good save by Ford, Bush slammed a kill home, and a Hartford attack error teamed with a UMBC block had the score back at 17-19. Hartford called a time out. The Retrievers picked up 3 more points after that with a spike out of bounds by the Hawks, Hoeks and Bush picking up a block, and Lang tapping the ball over. The score was 17-22 and Hartford called another time out. The Hawks went back at it with a Sydney Scott spike, and Ford placed a ball into a gap. Hoeks responded, and another UMBC point followed that, A Hartford spike into the net ended the set however, 19-25. UMBC 2, Hartford 0. This set would not be as even as the first 3 were as UMBC roared out of the gate to a 15-5 lead. Their scoring started with a Oscars service ace, another point followed, Hoeks put the ball down to the floor, Bush had a block, Hartford managed a point though it seemed to be a controversial call as the ref had to explain it, UMBC picked up another spike off the touch, but Cordell whipped a shot in for a UHa point, Kennedy then smashed the ball off a set. Nethersole got her team out of a sticky situation with a kill, but Oscars’s kill extended visitor lead, UH6 then picked up a kill off the blockers, Hartford benefited from a UMBC spike out of bounds, Oscars launched a kill, U of H hit the ceiling while trying to set up a return, and spike out of bounds, Oscars’s kill landed just in bounds, though Erin Macro got in on the scoring with a kill, but Hoeks spiked right back, a Hartford attack hit the antenna, and Bush had a cross court blast leading to a Hartford time out. A serve into the net by the Retrievers brought Hartford another point, but a tap attack by them landed just out of bounds. Despite a good dig by Spaay, a 2 contact error put another point in Hartford’s column, but a four point run followed for the visitors thanks to Lang’s kill, Bush’s cross court blast, a Hoeks service ace, and a Bush kill off the blockers. When Cordell whipped a kill cross court it brought the score to 8-20. Lang’s kill followed but Nethersole’s kill, and Boss’s service ace got the Hawks back within 11, still Kennedy had a blast form the net. But Cordell picked up a block and then added two straight service aces. UMBC called a time out with the score 13-22. A serve out of bounds by Hartford followed, though Erin Macro picked up yet another kill. Only Oscars had a kill of her own. A UMBC 2 contacts error was the next result, but a hit out of bounds by the Hawks ended set and match 15-25. UMBC 3, Hartford 1.